If your previous exposure to gladiolus plants consists of a few stalks leaning this way and that in the flower garden, give this summer bulb, technically called a corm, a second chance. A mass of two dozen or more gladioli in bloom creates a garden spectacle of spiky blossoms, with some left over for your floral arrangements. A member of the Iridaceae family, plants in the genus Gladiolus also go by the name flag flower and sword lily. Flower spikes can reach up to six feet in some varieties, adding drama to the border. Gladiolus plants produce trumpet shaped flowers that open from bottom to top on a sword-like stem, adding drama to the landscape and bouquets alike. Hybridizers have expanded the color palette so that few flowers rival it, short of bearded irises. One color you won't find in the glad flowerbed is true blue, although plant purveyors try to persuade consumers with lavender plants bearing monikers like "Blue Moon." Many modern varieties have ruffled or frilled petals, adding to their appeal. Start with premium sized gladiolus corms, which produce more blooms on heftier stalks. 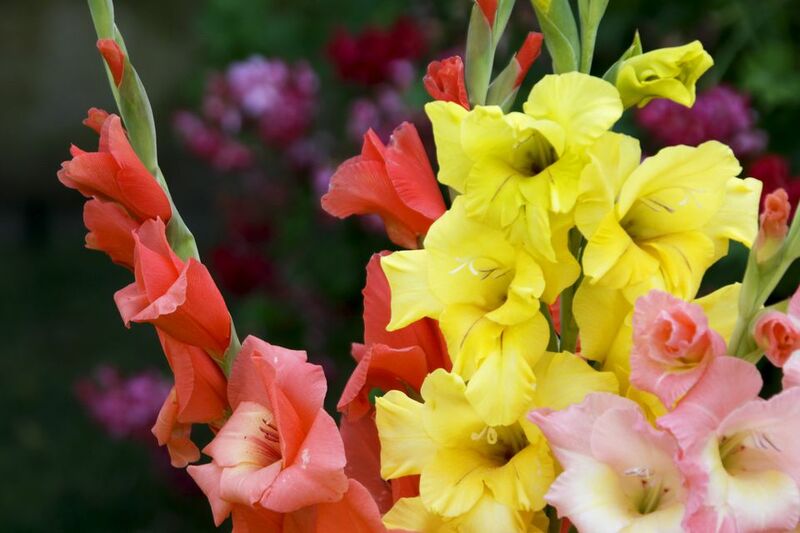 While you can get bargain bags of 10 centimeter glads for a reduced price, springing for 14 centimeter corms is a necessary first chapter of your gladiolus love story. Planting glads too early won’t reward you with earlier blooms: Gladioli pout in cold soil, and may even rot. Wait until night temperatures reach the 60’s before you set out your gladiolus bulbs, choosing a spot in your garden that receives at least five hours of full sun each day. Gladioli bloom from July until frost. However, the plants don’t bloom continuously, so planting new corms every two weeks will extend the blooming season. Any well-draining soil is fine for growing gladiolus bulbs. Although glads can tolerate shallow planting, placing them at least six inches under the soil’s surface provides support to emerging shoots. Gladiolus flowers may perennialize in zone 8 and warmer, but most gardeners treat them as annuals. When first frost strikes, you can dig your glad bulbs for winter storage. Dry them for a few weeks, and store them in a cool, dry place. Gladioli don’t need much attention after planting. If the weather is dry at planting time, you can water the bulbs once, but don’t water them again until you see shoots or you may encourage rot. Fertilize newly emerged gladioli shoots with a balanced, 10-10-10 liquid fertilizer. Keep your glads off the ground by staking them with half round plant stakes, hoop stakes, or single stem supports, depending on how many glads are in your grouping. Unless you plan to dig and store your bulbs, you can remove the plants when blooms are spent. If you do save the bulbs, let the plants continue to grow to store energy for next year's blooms. Thrips sometimes bother gladiolus plants. You may not see the tiny winged insects, but you’ll notice brown foliage tips and flecked foliage. Treat thrips with insect soap. Gladiolus plants are a smart choice for gardens where space is a premium. As annuals, the root system is limited, giving it a small footprint for the vertical accent these plants deliver. Even balcony gardens can accommodate a dozen gladiolus corms in a container. Move over, cosmos: gladiolus flowers make excellent vegetable garden companions. The flowers attract pollinating insects to increase those tomato yields, and the bold blossom colors won't get lost between your rows of beans and squash. Plant gladiolus corms in the gaps where you've yanked out faded spring veggies like peas and lettuce. Gladioli look ungainly when they aren’t in bloom, but you can hide their awkward phase in the flower garden. Some gardeners plant them in containers, and keep the containers out of sight until the plants are ready to bloom. Another strategy is to plant glads behind medium to tall plants that will come into bloom when the glads are finished, like zinnias or dahlias. Look for grandiflora hybrids, which have the largest flower spikes with the most flowers.